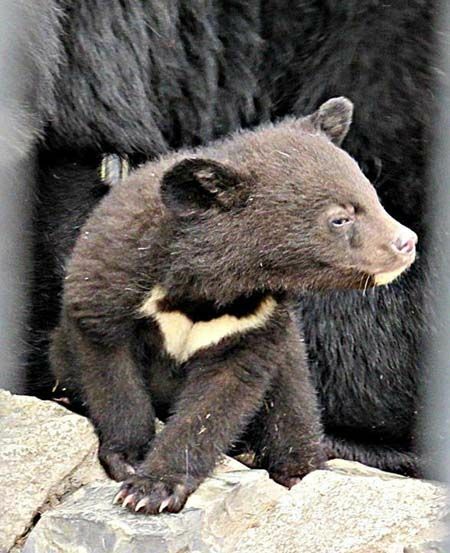 The Himalayan black bear (Ursus thibetanus laniger) is a subspecies of the Asian black bear, found in the Himalayas of India, Tibet, Nepal, China and Pakistan. 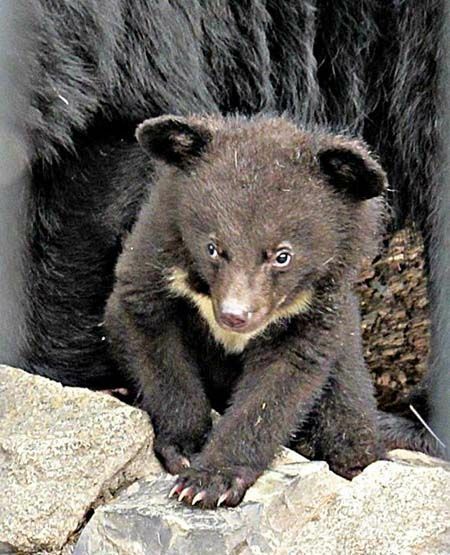 This subspecies is listed as ‘vulnerable’ due to encroachment of human population, forest fires and the timber industries; these have all reduced the bears’ habitat. There is also a high mortality rate among the newborn. 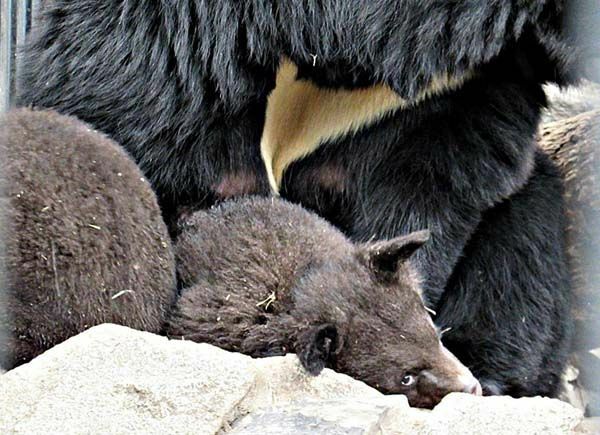 And even though hunting of the Himalayan black bear has been forbidden since 1977, there is still a large problem with poaching. 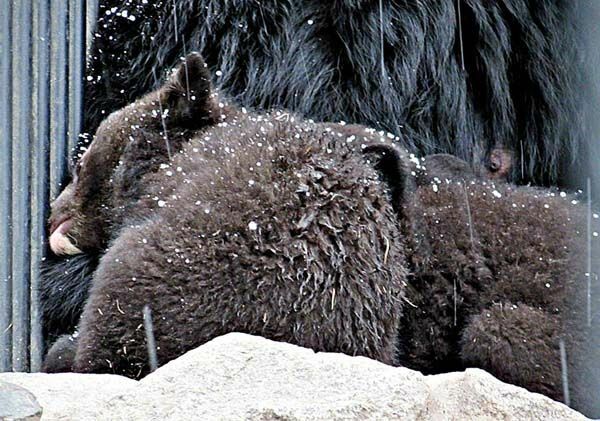 The Himalayan black bears Kostya (male) and Chelsea (female) in the Novosibirsk Zoo became parents to three sweet cubbies on the 12th of January 2018. 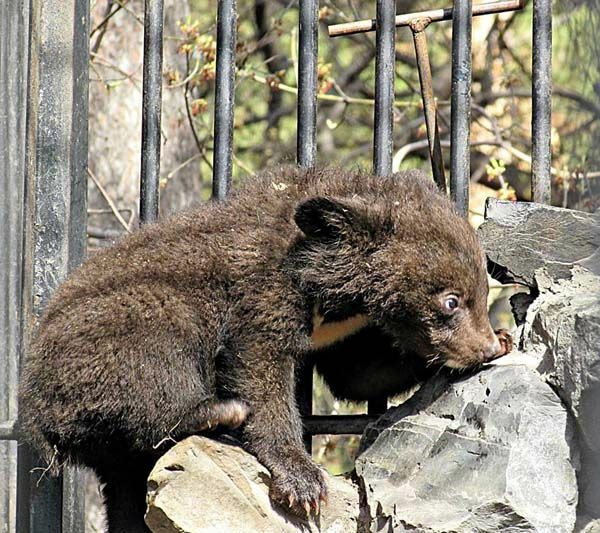 One of the cubs was sent to another zoo to be handraised. 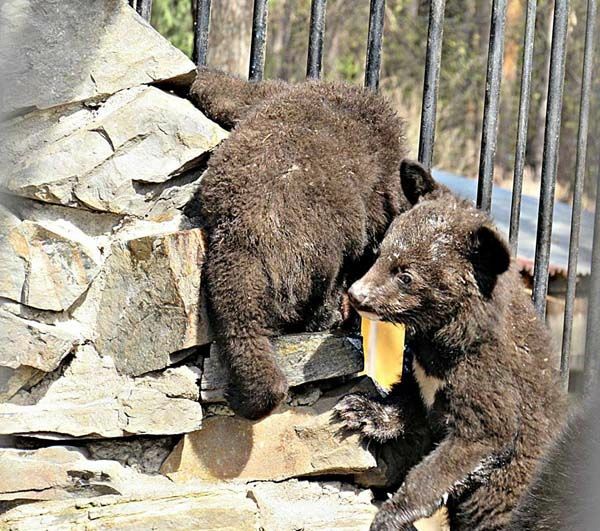 The reason was probably that Chelsea only could take care of two cubs. 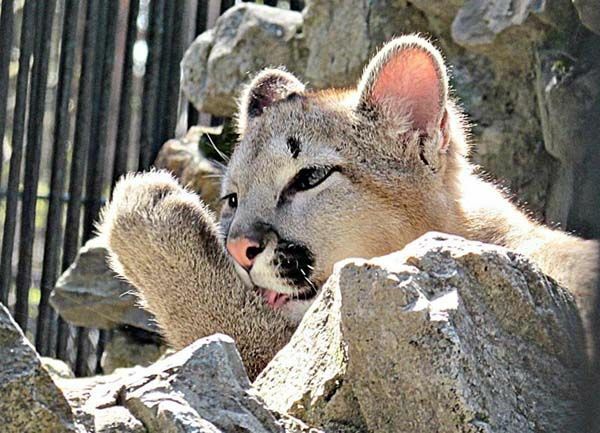 Because this species is vulnerable and very rare the zoo didn’t want to take any risks. 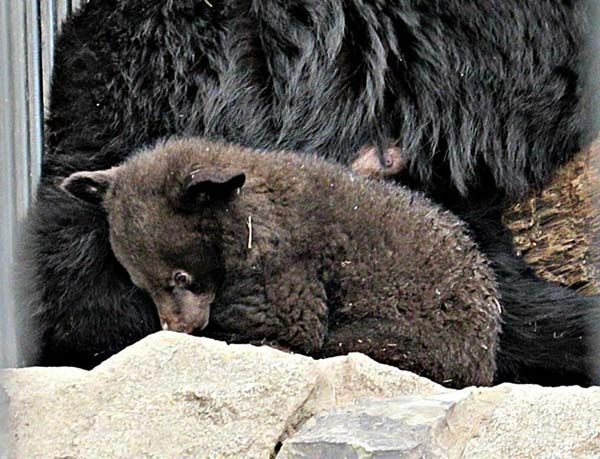 The cubbies (who have no names yet) are still very small so they spend a lot of time very close to mama. 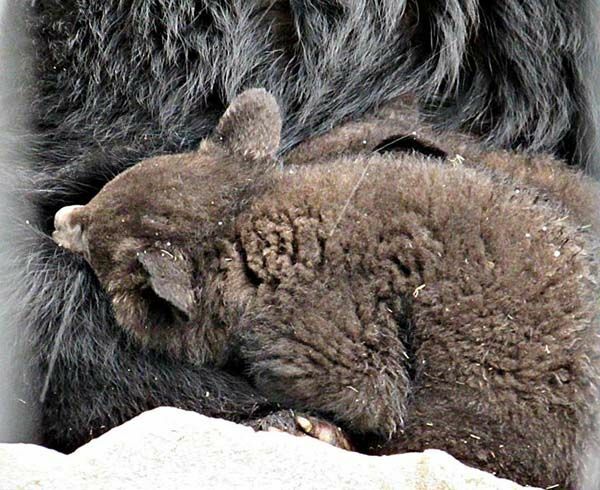 Of course, mama’s milk is the best nourishment for tiny fur balls. 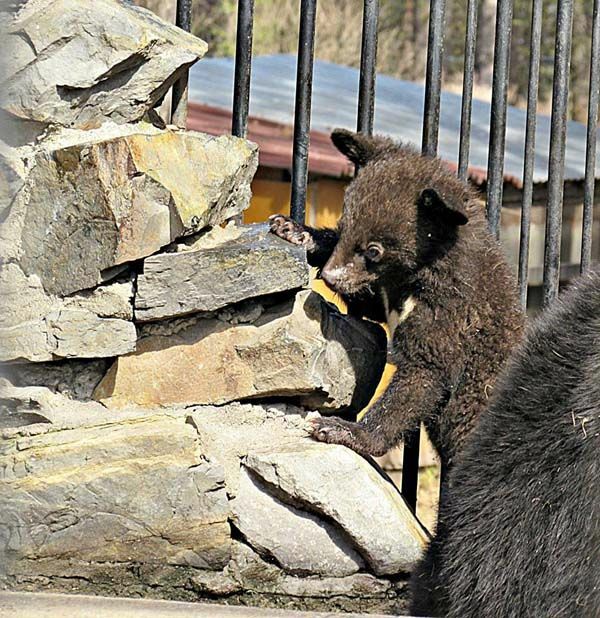 It looks like this cubbie has filled his/her belly …..
…… and is ready to explore the world. In this case the ‘world’ is their enclosure. Everything is thoroughly inspected under supervision by mama Chelsea. 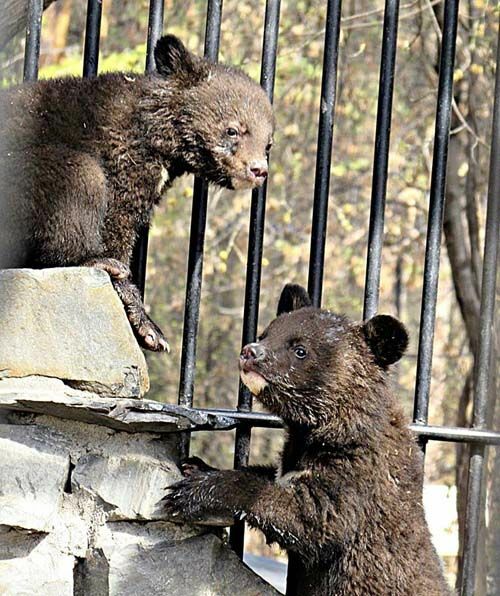 Although the cubs are so small they already want to try their climbing skils. 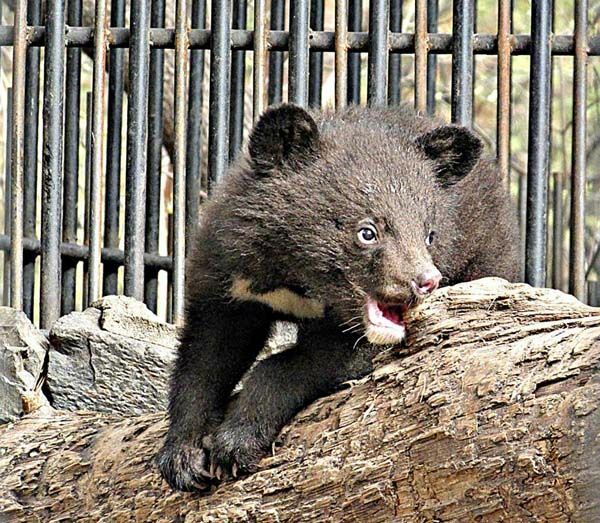 We are Himalayan bears so we will make it – sooner or later!! Let me help you! You can make it!! Yippee! You made it – I’m coming after you! You’ve already met sweet Sofinka (Sofia) in another report but I just have to show these lovely photos to you! Just like all cats Sofinka is very particular of her looks. She wants to keep herself presentable. A pawicure every morning is a ‘must’! 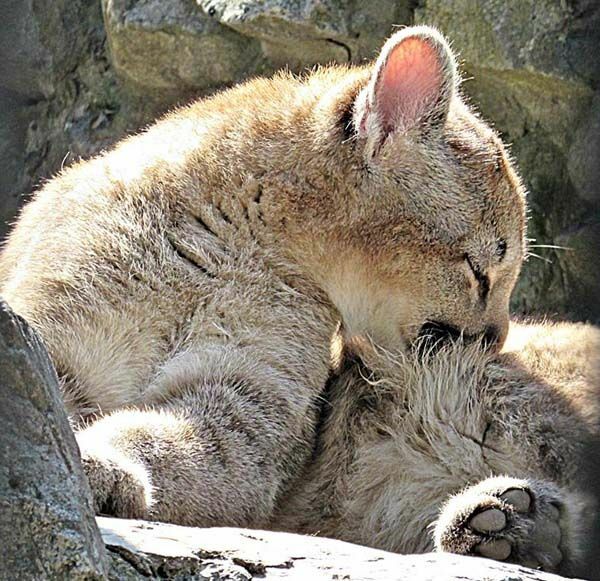 The whole fur is being washed. Now she’s ready to meet the visitors. I’m sure they are all charmed by this cute cat! Dear Anna! 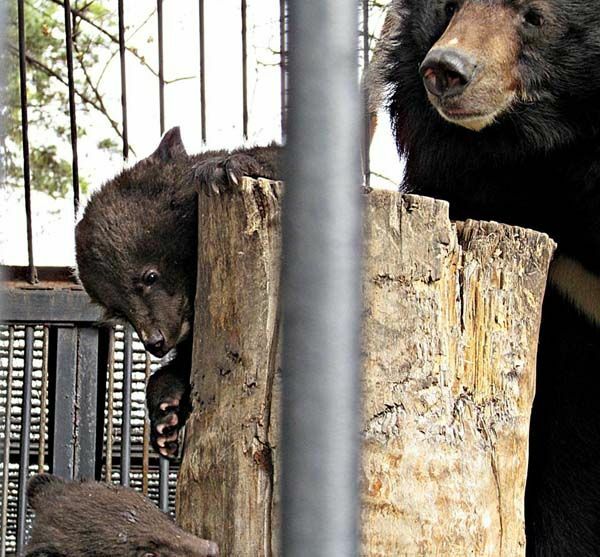 Thank you so much for the lovely photos of the bears and Sofinka! Mervi, thank you very much for the excellent article! Oh, these are unbelievably lovable fluffies. Wishing all of the good health and a happy life in general! 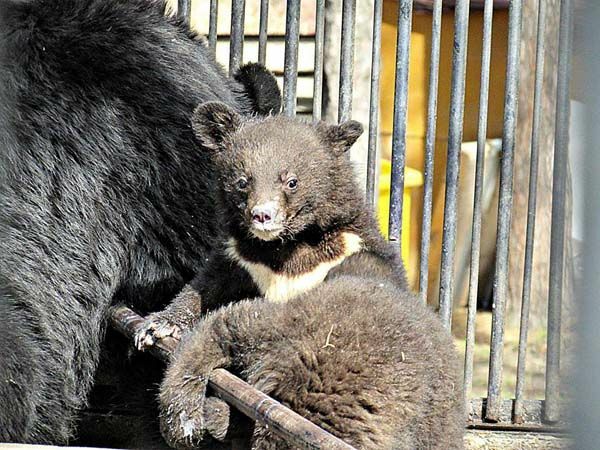 Aufwachsen im Zoo Novosibirsk ! 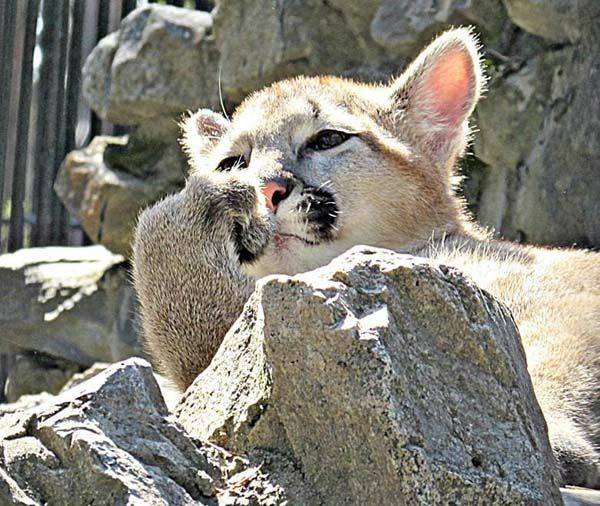 vielen Dank für die wunderschönen Bilder der Bärchen des Pumas. Die Bärchen sind allerliebst und ich wünsche ihnen ein gesundes Leben. Ich liebe die Katzenwäsche der Pumadame! 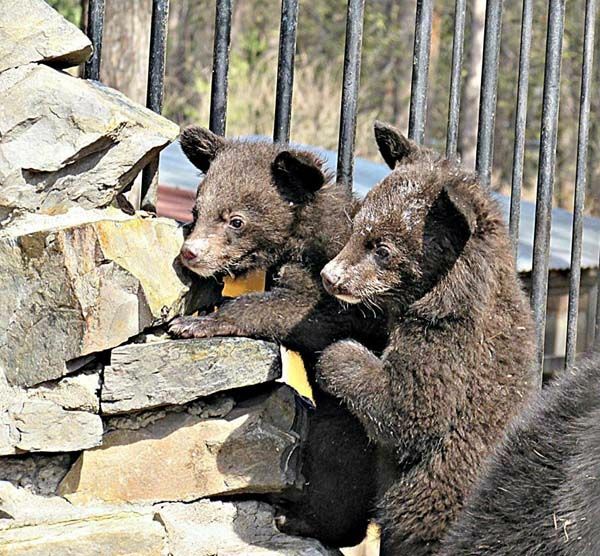 These little cubbies are so cute and the pics just wonderful. I fell head over heels in love with them and wish them and their parents all the best. I suppose Sofinka knows she is a beauty, the way she poses for the visitors. I am sure everyone is enchanted by her. Thank you for bringing us these delightful photographs! Thank you for the pictures of the cuties. Kostya and Chelsea have the wonderful kids. Sofinka is a beautiful girl. 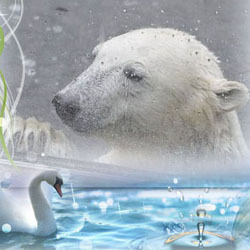 It is wonderful to see these beautiful pictures of such rare and precious animals. 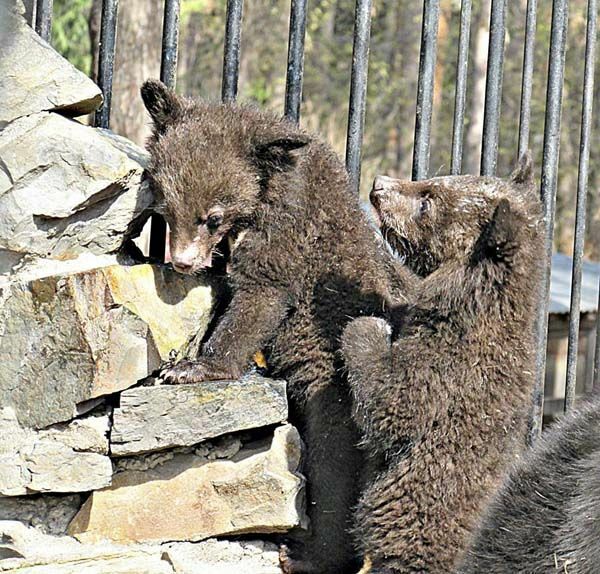 Die beiden Bärchen sind wirklich super niedlich. Die möchte man am liebsten knuddeln. 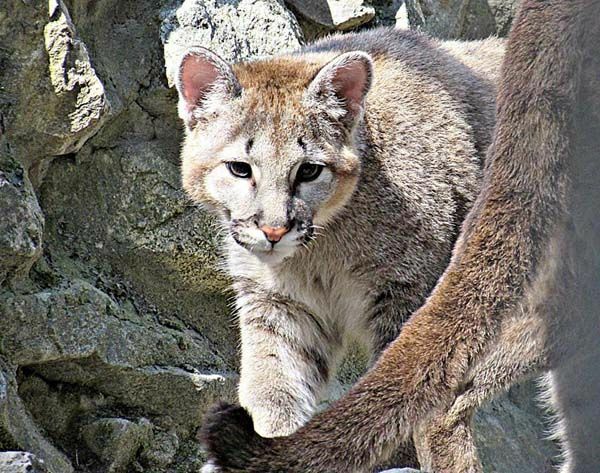 Auch die Fotos vom Puma sind wunderschön. Natürlich ist auch die hübsche Katzendame sehenswert. ja die Kleinen sind allerliebst! 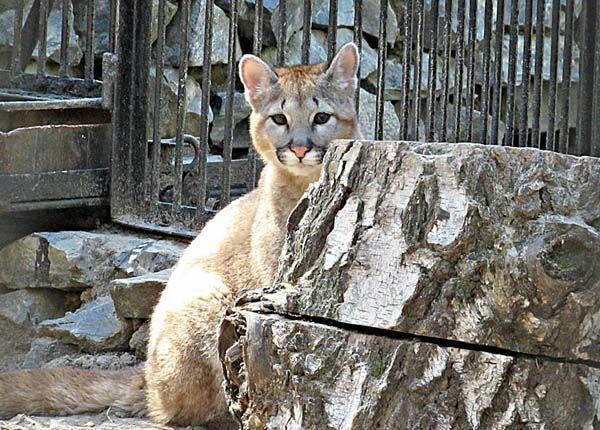 Bei uns heißen diese Bären “Kragenbären” und leider sind sie in den Zoo´s nicht mehr oft zu sehen. Auch Katzenkinder sind ganz süß und Sofinka ist eine ganz hübsche. Danke für so viele niedliche Bilder von den Kleinen. Log in | 54 queries. 0.812 seconds.